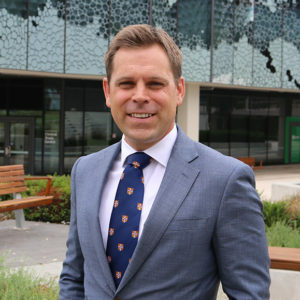 In a move that will keep one of Adelaide’s best and brightest medical minds in the State, Dr Adam Wells has been appointed the next Abbie Simpson fellow. A position jointly funded by the NeuroSurgical Research Foundation (NRF) and the University of Adelaide – Adam’s job will be to establish a State Clinical Neurosurgical Facility. Adam is aiming high with plans for the Neurosurgical Facility, hoping to develop a trauma bank that would result in better outcomes for trauma patients. “If we can capture the physiological data, the outcomes and match them with the pathological data (blood samples), then in the next 10, 20, 30 years, we will have a world class storage facility of tissue samples matched up to the physiology”, he said. Adam hopes this will lead to a better understanding of what happens in trauma patients, an area where there are so many unknowns. “We don’t know why some people do well and some people don’t in trauma”, he said. Growing up in the western suburbs of Adelaide, Adam knew in primary school he wanted to be a doctor. Graduating from his local public high school with top marks, he was one of only a few from his school to continue to university. “I was lucky enough to have a good cohort of friends who were reasonably bright and high achievers. A number of us went to university which was against the grain in that school at that time,” he said. Neurosurgeons with research background are rare. Adam is one of the few to have a strong background in research, obtaining a Bachelor of Medical Science and a PhD to compliment his MBBS. “Early on in my medical training, I developed an interest in surgery, sparked by lectures from Professor Nigel Jones. I approached him looking for research opportunities and through a research elective and project with him, I developed the research bug,” he said. After Adam completed a year of research under Nigel’s supervision, investigating spinal cord injury in rats, he was accepted into the Australasian Neurosurgical Training Program, one of only 10 accepted per year in Australasia. Following his training, Adam was looking to get involved in more research. He approach the NRF for funding a year of research, which subsequently tuned into three years, resulting in his PhD. Adam’s training has taken him interstate to Hobart and Perth, and overseas to the Cambridge, before he returned to Adelaide where he was approached about a position as a Senior Clinical Lecturer with the University of Adelaide. Adam credits the support of his wife, who is trained as a dietitian, with his flourishing career. This entry was posted in Alumni eNews and tagged alumni, neurological, University of Adelaide. Bookmark the permalink.